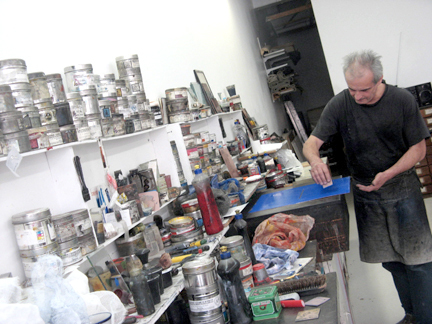 Everyone in the Quebec printmaking milieu knows Alain Piroir. 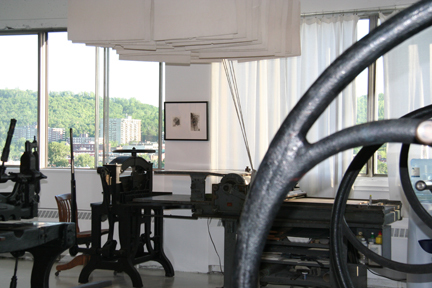 The master printer, who moved to Montreal from Lyon fifteen years ago, is a gift to printmakers. When he immigrated he worked at Atelier Circulaire for eighteen months, which is where I met him for the first time. During this period Alain landed a contract to print for Jean-Paul Riopelle. He worked for four months at L’Isle-aux-Grues, where Riopelle was living at the time. 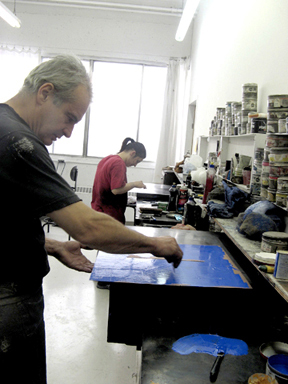 Task at hand: to set up a printmaking studio, provide technical assistance to the artist, and to print the bon à tirer proofs which would become part of the artist’s book, Le Cirque, written by Gilles Vigneault. Once a print meets the artist’s expectations, this becomes a bon à tirer, « good to pull » proof. There were days when Riopelle wasn’t very motivated to work on his copper etchings, however, says Alain, the legendary Quebec artist was pleasant to work with. Alain printed the entire edition of the book in Montreal with his daughter, Agathe, Elmyna Bouchard, and Yann. 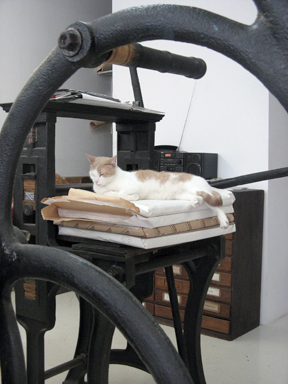 After this Herculean project Alain established his own printshop on St. Denis Street. Since then he has moved his studio twice, once to Mt.Royal Street, a hop away from the effervescent buzz of the Main, and then to Casgrain, across from Atelier Circulaire. I have had the pleasure of working with Alain in all of his studios. I remember the day I brought my son, four months old at the time, to the St.Denis location. Pablo had fallen asleep in the car. I carried my sleeping babe–bundled in his snowsuit and strapped into his car seat–and propped him on the kitchen floor, expecting the usual hour-long nap. I was itching to help Alain print, dying to get my hands dirty with something other than a diaper change. Alain warned me not to print. Having been a parent for longer than me, he knew what he was talking about. Just as I started dabbing my Pthalo blue ink on my collagraph plate, Pablo started to cry! Fortunately I have had many other chances to work with Alain. Through the years he has gotten to know my work. I am always amazed at how quickly he can grasp the mental image of what I want and turn it into a real, live print. I can describe a color, or a group of colors, and he mixes away until the hues appear. He is steady, indefatigable, an impeccable technician, and never imposes his own esthetic. The most exciting printing sessions were when he printed my large formats, one of which will be on exhibit at my upcoming show. Two words to express the experience of having my work printed by Alain: pure luxury. Twelve years have gone by since I took my baby to Alain’s studio. My son is taller than me now. Atelier-galerie Alain Piroir has also grown. Its present location on Casgrain Street boasts a sweeping eighth-floor view of Mile End, set against the undulating backdrop of Mount Royal. The wall-to-wall windows invite a flood of sunlight into this magnificent loft, that includes a unique gallery space. At night, the atmosphere is nothing short of magical as the view transforms into a glittering urban galaxy. Can you tell I am trying to lure you to my March 6 vernissage at Atelier-galerie Alain Piroir? 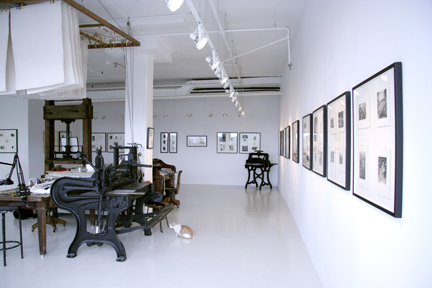 This printshop is practically a museum. Some people collect stamps. Alain collects presses. 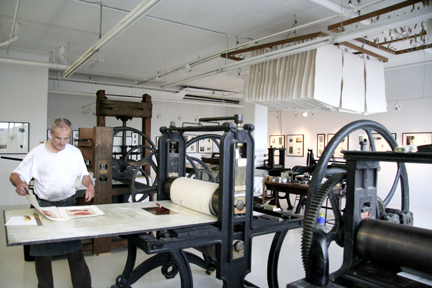 He owns six etching presses, one typography press, paper and metal cutters, and an impressive two-hundred year old binding press. Each press has a story. Three of them traveled to Quebec from France by boat. If you think that is a poetic image, wait until I tell you about another story that involves a boat and presses. Attendez! That’s my hook to keep you reading! Among the presses that were shipped from France there is an adorable mini Bertrand that would look very smart in my living room. Agathe, who is wiping a Martin Muller plate, points out that her father designed the press with the wooden frame. Alain explains that he created it in France out of scrap, at a time when he had lost all his presses. It is an unusual looking contraption but I would never have guessed its humble origins. Alain has come a long way since those days. His impressive collection includes two Ledeuils, one of which used to belong to Albert Dumouchel. Alain, originally trained in marquetry, went on to study fine arts for five years in Lyon. After earning his Diplôme nationale de gravure in 1974, he moved to Paris, where he worked as a printer for seven years at Georges Visat’s art publishing studio. He printed bon à tirer proofs for big names such as Francis Bacon, Max Earnst, and Roberto Matta. If he decided to do it, I think he could do it. It takes a real visionary to have gotten to where he is now. Printmaking is not dead but let’s just say that it takes a lot of love, passion, conviction, and perseverance to keep it alive! Alain and Agathe are forever full of projects, always striving to increase visibility, reputation, and let’s not forget income. Alain agrees, giving the example of art publishing as one of their goals. He has already published prints of high-profile artists such as Louis-Pierre Bougie, Francine Simonin, and Martin Muller, and done co-editions with Galerie Éric Develin and Galerie Lacerte. Now he wants to publish prints for international artists and organize related events to attract the media and art collectors. I look forward to exhibiting my latest show, Animal Instincts, at Atelier-gallery Alain Piroir. I am anxious to see my prints, hot off the press, hanging in this glorious space. I can’t wait to share the sparkling nocturnal view with you on Friday March 6. I’m in my early 30s with two kids (one special needs). This year I’m thinking about putting in the 20k from my savings via the mega backdoor leaving me with a lacklustre 100k in the savings account. If a wealth emergency happens comment gagner de l’argent I can just cull it distant (I the hang of this could be humiliate due to shop fluctuation, but ultimately all contributions can be entranced in sight). In a minute I get things reject together, very recently attribute the scratch rear in via mega backdoor for the sake of the next year. In school Aqua massage master of massage will hold best vacuum massage jars . Our masseurs quite qualified in order to as a result session chiromassage massage you felt yourself easy magically and were inclined to inconceivable sensual actions. The spa center sensual invites find out one of the options massage, is what we do. The elegant women our the spa salon will give you an unforgettable experience. The salon is a place of rest and relaxation. We in NY we advise stunning Spa rooms with convenient style. Data accommodation help to stay with you incognito. Good models will make you Music Therapy and russian massage, you can find several types massage on your discretion. Success organization adult massage at, so as to , in home you received from him satisfaction. 38 requêtes. 0, 183 secondes.